Last night, supporters of County Commissioner Victoria Reinhardt and State Representative Leon Lillie gathered at a local restaurant to watch their primary returns come in. Michelle snapped a picture of me with Victoria Reinhardt and Franni Franken. 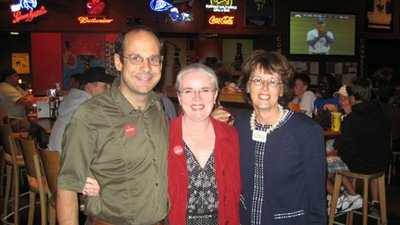 If we look happy, it's because the results from the polls were good -- Victoria got 68.22%, and Leon got 73.37%, so both advance to November's election in very strong positions. I did some volunteering for both campaigns, and was very happy to see the hard work and planning of the candidates and their campaigns pay off.